LCFC capped off its four-game homestand with a 1-0 win against the Charlotte Independence on July 11 and enters this weekend with a three-game winning streak, outscoring its opponents 10-2 during that stretch. Matt Fondy (10) and Magnus Rasmussen (6) have been Louisville City’s go-to goal scorers. Fondy, formerly with the Chicago Fire (MLS), has been a force and a steady presence in top of the attack for City, as he’s also contributed four assists while starting every one of their 16 USL games this season. He only trails Pittsburgh’s Rob Vincent in USL’s Eastern Conference in goals scored. Louisville’s defensive unit has been solid throughout the season, conceding just 14 goals, as goalkeeper Scott Goodwin has posted USL’s second-best seven shutouts while playing in all 16 games for LCFC this season. When Louisville City FC opened its debut season with a five-game unbeaten streak, one of the most memorable moments to keep that hot start intact was a stoppage-time, game-tying goal off the left foot of Kadeem Dacres to earn a 1-1 draw against the Riverhounds in April at Highmark. Louisville sits two places above the Hounds in the Eastern Conference as the final third of the regular season approaches. Pittsburgh missed the chance to move within a point of Louisville and the coveted top four positions last Sunday with a 4-2 loss at F.C. Montreal. Six Eastern Conference teams qualify for the postseason with the top four guaranteed at least one home game. Sunday’s loss in Quebec ended a run of four games in which the Hounds’ back line had held firm in open play. A Rochester Rhinos penalty kick was the only blemish on an otherwise perfect defensive record. The Hounds’ offense continued its impressive output in Canada with Rob Vincent and Kevin Kerr becoming the first teammates to reach a combined 20 goals in league play this year. Vincent’s 12 goals and four assists place him top of the Eastern Conference and second overall in the USL in goals, goals-per-game, points and points-per-game. Hounds goalkeeper Ryan Thompson remains with the Jamaican National Team, as they will be playing in the Gold Cup vs Haiti around the same time as the Riverhounds-Louisville City clash. Thompson came off the bench in spectacular fashion, making some big saves to help the Reggae Boyz post a 1-0 win over El Salvador that helped them win their group. Coach Steffens cited earlier this week that his team is mostly healthy, but said that only Tyler Pasher will be sitting out this week as he recovers from illness. While Louisville has been stingy in the back this year, posting seven shutouts, they’ve also shown the ability to score. With 10 goals in their last three games, that has to have the attention of Mark Steffens and his coaching staff to make sure they remain organized in the back and midfield. The Hounds will have to win the possession game on Saturday to minimize Louisville’s chances – and try to dictate the tempo – and look to open things up on the flanks to create scoring chances. Louisville seemed to do a great job of minimizing Kerr, Vincent and the Hounds attack in April as that was one of their quieter games. 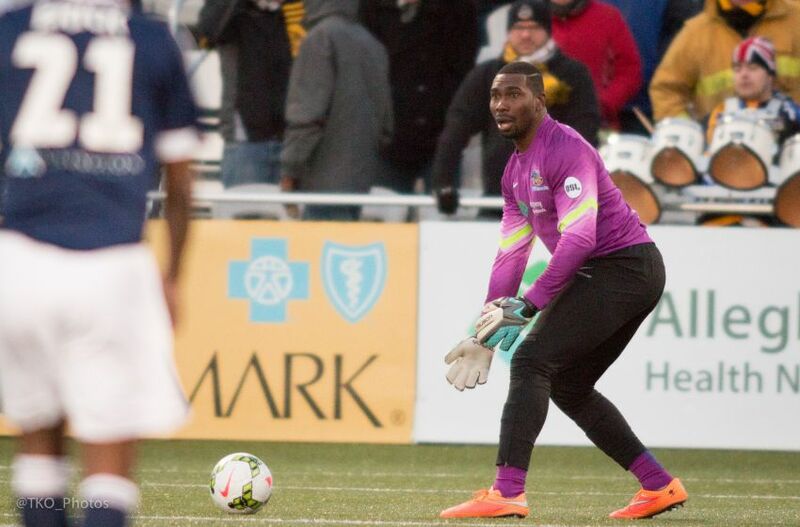 Calle Brown’s done a formidable job holding down the goalkeeper spot for the Riverhounds most recently, but it was Thompson who did a spectacular job in the last outing making five saves including a penalty shot attempt late in the 85th minute. Led by a strong defense, and potent attack, Louisville seems to be a savvy USL side that will do what it takes to get results. Like the Riverhounds, they only have one road win, but have also settled for three ties away from home in six games. The biggest and most glaring difference between the two teams is goals allowed. While these are the top two teams in goals scored in USL’s Eastern Conference (Riverhounds have edge 35-30), the Hounds have given up twice as many goals (28-14). 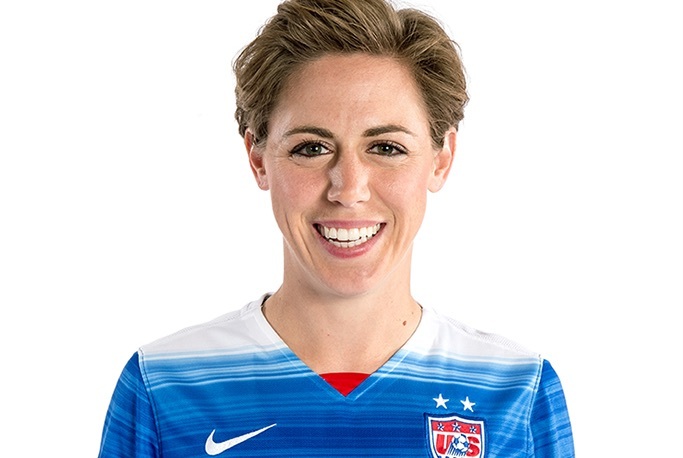 FIFA Women’s World Cup winner Meghan Klingenberg will be the Hounds’ special guest for Saturday’s game. The Gibsonia native will share her World Cup experiences with Club Level guests as part of our pre-game buildup beginning at 5:30 p.m. Club Level guests will also be given a private photo and autograph session with Klingenberg. Proceeds will benefit the MK Foundation. All fans in attendance will receive a free Klingenberg player card sponsored by our partners at Allegheny Health Network. Club Level and general game tickets are almost sold out for the game. The Riverhounds are advising those interested in attending to visit Riverhounds.com or call the Highmark Stadium box office on (412) 325-7241 to speak with a representative about remaining availability. The Highmark Stadium sports bar will also be showing the Concacaf Gold Cup quarterfinal tie between the United States and Cuba at 5 p.m., followed by Ryan Thompson and Jamaica’s meeting with Haiti. Fans unable to attend Highmark Stadium on Saturday will be able to watch a live stream at Riverhounds.com.